Focus fell neatly on the written word during this week of the Tipperary murder trial. Evidence was heard of a note discovered in the home of defendant Patrick Quirke - and of indentations discovered on the same sheet of paper which told of previous writings. There was evidence of a flurry of solicitors' letters sent between the legal representatives of Mary Lowry and Mr Quirke as they settled the ending of their lease agreement for the land at Fawnagowan, Co Tipperary. We also heard of an anonymous text message sent to Ms Lowry in the months after the disappearance of her boyfriend, Bobby Ryan, which warned her that she was being watched. Judge Eileen Creedon yesterday warned the jury not to discuss the case, which, she said, "was really being discussed by just about everyone in the country, at this point". On Tuesday, the jury was told of a handwritten note detailing a series of questions about the disappearance of Mr Ryan. The note speculated that the naked state of his body meant "he was either murdered and the clothes taken off or that he never left the house". Garda John Walsh said the note was found in a search of Mr Quirke's house on May 17, 2013. Mr Quirke (50), of Breanshamore, Co Tipperary, has pleaded not guilty to the murder of Mr Ryan (52), a part-time DJ known as 'Mr Moonlight', on a date between June 3, 2011, and April 2013. Gda Walsh read the note aloud, beginning: "Mary last one to see him? Body naked, either murdered and clothes taken off or never left the house?" He said the words "never left the house" were underlined. The note continued: "How did she find his van so quickly? Why did she look for him in a place she knew he wouldn't have needed to go....Very strange...Token search...Why wouldn't she act on leads of travelling salesman?" There were other questions such as why she gave "varying accounts" of how long Mr Ryan was in the yard and ended: "Why was she relieved when 'Crimecall' was a rubbish programme and got no help to jog anyone's memory." The following day, the jury heard indentations on the same sheet of paper were deciphered. Detective Garda Jeremiah Moloney from the document and handwriting section of the Technical Bureau told the trial he used an electrostatic detection apparatus - or ESDA device - that can detect indentations caused by pen pressure from previous writings. On the front of the page he discovered indentations at the top which read "pallet chains", followed by "Gary ( ) empty tank two loads", as well as "agitate need water". Among the indentations on the back of the page was found: "What the guards will know", "murdered poss in house", and the words "dispose" and "Mary". Line 16 read "dispose of clothes\phone\any other evidence", said Dt Gda Moloney. Between lines 20 and 21 were the words "phone pinged". 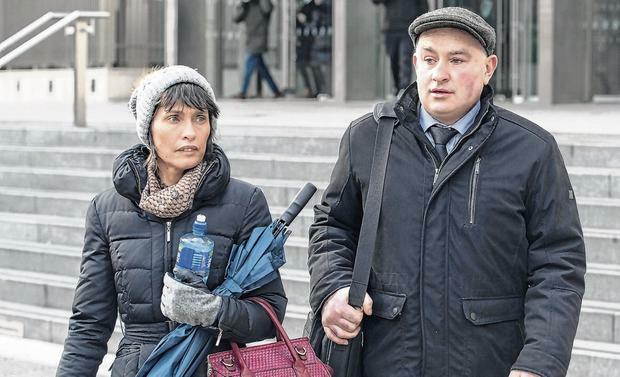 The jury heard of a series of solicitors' letters sent between Ms Lowry and Mr Quirke, which began in December 2012, in which they agreed to terminate his lease of her farm. One of these asked Mr Quirke to refrain from entering Ms Lowry's property and restrict his activities to the farmland and to day-time hours, if possible. A reply from Mr Quirke started he was "extremely disappointed" matters had deteriorated between them. Meanwhile, the trial heard gardaí have never discovered the identity of the person who sent a text message to Mary Lowry three months after the disappearance of Mr Ryan. Phonetically written, it read: "U tink u r so col out partyn lik Bobby nevr existd. We no u hidn somethn nd wer gonta watch u till u crak." Translated, it read: "You think you are so cool out partying like Bobby never existed. We know you're hiding something and we are going to watch you until you crack."